The Zawinul Syndicate has booked performances in Yokohama and Tokyo during the week of October 8-12. 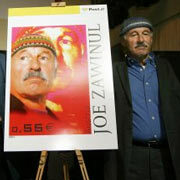 These are Zawinul’s first appearances in Japan in several years. According to the info I have received, the drummer will be Nathaniel Townsley, while the rest of the line-up (Linley Marthe on bass, Amit Chatterjee on guitar, and Manolo Badrena on percussion) remains the same. The Syndicate will return to Europe in late October and November. Concerts are booked in Switzerland and Austria. It would probably be a good time to point out that I do not have an official itinerary for Zawinul. Since I am not given official itineraries, I simply use the best information that I have on the Tour Dates page. I will include a link to the venue or the event, if I can find one. The following seems obvious to me, but I guess it needs saying: Use the Tour Dates page as a guide. Always contact the venue for confirmation and to purchase tickets. Don’t just show up because you read it here. A nice article about former Syndicate drummer Paco Sery popped up on the web recently, in conjunction with Sery’s performances in South Africa.